On April 28, 2015, Sinopacific Shipbuilding Group (SINOPACIFIC) held a christening and delivery ceremony for a newly built SPA150 AHTS, constructed for shipowner FEMCO Group. This first SPA150 vessel is not only the first of this design to be delivered in the world, but is also the first of a series of four vessels contracted by FEMCO Group. 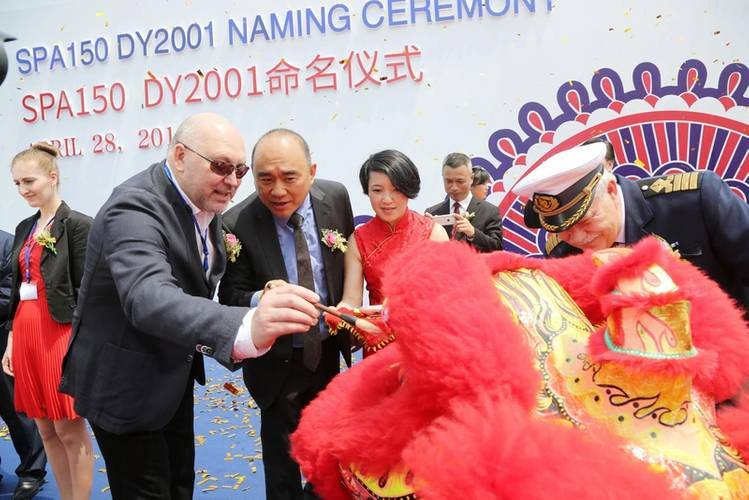 Representatives from the Government, banks, shipowner, classification society, supervisors, suppliers, brokers and media, as well as other related parties, were present at SINOPACIFIC’s Zhejiang Shipbuilding base and witnessed this rather memorable moment. The vessel’s godmother, Semenova Svetlana, christened this vessel as Ossoy. SPA150 with 12,000HP propulsion and 150t bollard pull, marks the first medium size AHTS in the SP series which is the in-house brand belonging to SINOPACIFIC and is designed by SDA (Shanghai Design Associates), the SINOPACIFIC OSV design team. 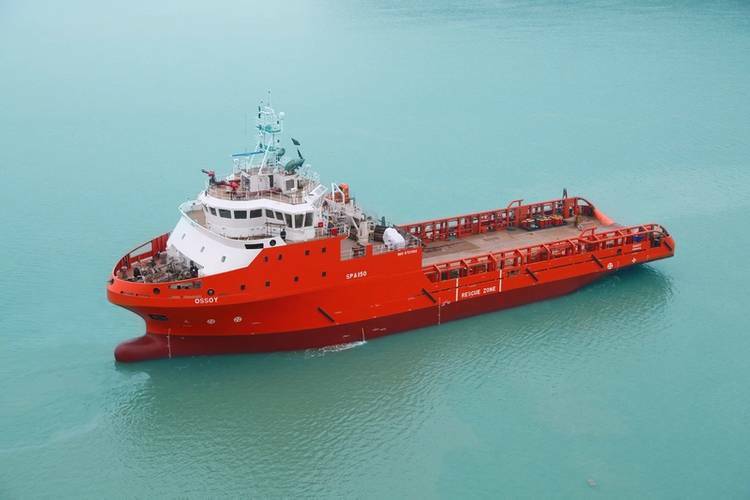 With an overall length of 72m, a molded breadth of 17.2m and a 515m2 cargo deck with 10t/m2 uniform load, the vessel uses a Class 2 Dynamic Positioning System (DP2) and is suitable for different kinds of offshore support work, including anchoring, tugging, external firefighting (Fi-Fi 2), oil pollutant recovery, as well as loading kinds of liquid and dry cargoes. An additional strength of the design team has been to offer flexibility and specific configurations for each vessel so as to customize each one to FEMCO’s specific demands, the shipbuilder said, adding that such efforts as well as the strength of SINOPACIFIC’s SP brand attracted Rolls-Royce Marine (Rolls-Royce), a global supplier of power systems. Together, SINOPACIFIC and Rolls-Royce developed close communication at the early stages of engineering and both parties managed to create, through this close partnership, an optimized solution for this medium size AHTS project. Rolls-Royce has provided integrated equipment packages for the SPA150 series, which has been a first for Rolls-Royce in the Chinese market, where, usually, such packages are only supplied for their own design vessels. SINOPACIFIC is a privileged partner of Rolls-Royce amongst Chinese shipbuilders. The whole construction period has witnessed a new round in SINOPACIFIC’s project management upgrading, which is further approaching an international level for offshore project management and has ensured the timely delivery of this newly built SPA150, the company noted. Simon Liang, Chairman and CEO of SINOPACIFIC, said, “To accomplish our proactive strategic planning, we have to leverage a full range of technical innovations and project management practices. In the future, we will continue to engage in realistic work and make constant improvements.